Mom holding her youngest grandchild. 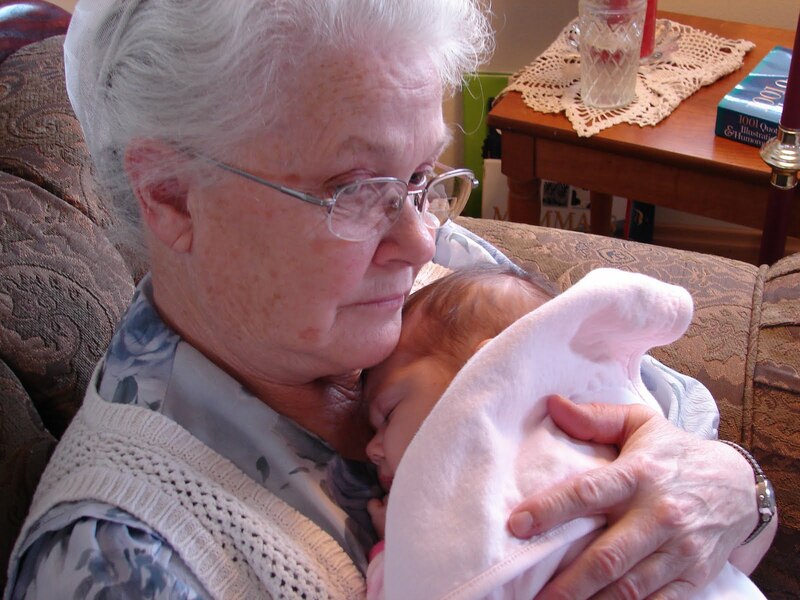 She is also a great-grandmother to two almost three of our grandchildren. And I remember when she was 24! Mom is a good mom to all nine of us. She prays for us everyday and tries to talk to each of us every week either by phone or email. We’re praying for you, Mom, these days while you agonize over your children daily. Maybe this is the hardest thing a mother is called to do…trust Him when she can’t reach or help a child in deep trouble. OH you go and make me feel like crying…. I have to think…how many memories will my kids have of my mom and dad? Not a lot really. I hope I can impress on their minds how special Grandpa Sids are! And I've been thinking too of mom, it has to be pretty tough right now. Praying for your family as you trust Evie to God. There is peace and comfort in knowing God loves our children more than we do, As a parent it is sometimes not easy to trust our children to His care when we can do nothing. Take comfort in believing God knows, understands, cares and is not limited.